Whilst every effort is made to ensure that the information contained in this publication is correct, the publisher makes no warranty, expressed or implied, as to the nature or accuracy of such material to the extent permitted by applicable law. © 2012 Kenter & Co Publishers’ Representatives BV No part of this publication may be reproduced, stored or used in any form, or by any means, without specific prior permission from the publisher. Latest M&As •	Thai petrochemical giant PTT Public is selling its 40% stake in PTT Phenol Company (PPC) to PTT Global Chemical (PTTGC), a major shareholder with 60% stake in PPCL, for 4,976 million baht. PPCL is a producer of phenol compound with all of its feedstock (benzene and propylene) supplied by PTTGC. Its production facilities are located in Map Ta Phut industrial estate, Rayong province. Currently, PPCL has a nameplate capacity of 200,000 tonnes/year for phenol, 124,000 tonnes/ year for acetone, and 150,000 tonnes/year for BPA. •	US-based private equity firm Arsenal Capital Partners has bought Arnco, one of the world's largest suppliers of polyurethane products. Arnco is the first acquisition of Arsenal under the umbrella of Dash Multi-Corp, a platform portfolio company focusing on the speciality technologies of polyurethane systems, vinyl plastisols and recycled rubber products. Arnco, headquartered in South Gate, has global manufacturing capabilities in the US, UK and China. •	Germany-based Bayer MaterialScience (BMS) is selling its global powder polyester resins business and its US-based liquid polyester resins merchant business to Stepan Company of Northfield. BMS acquired the Columbus facility in 2000 when it purchased Sybron Chemicals. Powder polyester resins are used in a variety of coatings applications, including industrial metal and transportation coatings. Liquid polyester resins are utilised as building blocks in various coatings and adhesives. •	Indian machine maker Windsor Machines has acquired Italian injection moulding machine maker Italtech through a Dutch joint venture Wintech for an undisclosed amount. Wintech will hold 80% of Italtech, with the remainder owned by Geoplast, an Italian plastics processor and a sister company of Italtech. Owned by car maker Fiat until 2004, Italtech manufactures dual-platen machines for the production of large components for the automotive market. •	Chinese engineering plastics maker Kingfa Sci & Tech is set to acquire a 66.5% stake in Indian compounder Hydro S&S Industries, which has been making losses for the past two years. Hydro, which has a capacity of 30,000 tonnes/year of reinforced PP compounds, TPEs and fibre-reinforced composites, is also a supplier to OEMs of automotive component makers. •	Japan’s Asahi Kasei Group is buying the 50% stake that US firm DuPont has in a joint venture making polyacetal copolymer resin in China. The ownership transfer of the 20,000 tonne/year-facility in Zhangjiagang, Jiangsu, needs approval from the Chinese government. has acquired Italian Nuova Protex that specialises in designing and manufacturing takeup winding systems for synthetic fibres like monofilaments, multifilaments, raffia, flat tape and strapping tape as well as supplementary components. The company will operate as Reimotec Winding Technology, part of the business unit Reimotec. China. The company's plan for an integrated asset exceeds US$1 billion, the largest capital investment undertaken by the firm to date. Earlier this year, Invista announced it had received approval for a 215,000-tonne/year HMD plant at SCIP, to be operational by mid-2015. •	US firm Albemarle Corporation and Senze Meilu of Shanxi, China, are to establish a joint venture to build a 50,000 tonnes/year facility to manufacture Martinal fine precipitated alumina trihydrate flame retardants based on Albemarle's proprietary technology and principally used in wire and cable applications. Production is expected to begin in mid-2015. •	Solvay Specialty Polymers is completing a commercial-scale polyethersulfone (PESU) micropowder production line in Panoli, India, to expand capacity by several hundred tonnes to support growing demand for epoxy tougheners in the composites industry. formation, after which Ineos would be the sole owner of the business. Solvay would be entitled to receive upfront cash payments of EUR250 million upon completion of the transaction. In other news, Ineos Barex is acquiring Japanese firm Mitsui Chemicals’s Polyacrylonitriles (PAN) business, including PAN resin and Zexlon film, to give it a foothold in Asia. This agreement also allows Mitsui Chemicals to secure a long term supply of PAN for its current customers as it transfers ownership of the business to Ineos Barex. The value of the transaction was not disclosed. PAN resins are inert products manufactured by Mitsui Chemicals under license, at its Nagoya works. Film and sheet applications include pharmaceutical and medical packaging in the Asia Pacific region. Ineos supplies PAN co-polymers, sold under the Barex brand name, primarily in the US and Europe. Barex is a specialised acrylonitrile-methyl acrylate co-polymer that has both US Pharmacopeia and FDA clearances for medical and pharmaceutical packaging. The chemistry behind Barex makes it readily convertible into film, sheet and bottles on standard equipment using extrusion, injection and calendaring techniques. Barex resins provide chemical resistance essential for packaging aggressive active ingredients that need to stay inside the packaging while also providing excellent oxygen barrier properties. ermany-based chemicals company Bayer MaterialScience (BMS) recently inaugurated a regional innovation hub for Asia Pacific in Shanghai, China. It has a workforce of 200 who are to innovate ideas for the use of polyurethanes (PUs), polycarbonates (PCs), foams and coatings in key sectors such as mobility, construction, IT and renewable energy. CEO of BMS Patrick Thomas said the hub will become a significant contributor to the firm’s overall global innovation network. “We are determined to keep growing in the Asia Pacific region. But further growth will only be achievable through innovation,” he said at the inauguration ceremony. Asia Pacific is among the strongest growth regions for BMS and accounted for more than one quarter of its total sales in 2012. This growth is mainly driven by a rising number of infrastructure projects and increasing demand for cars, electronic/consumer goods and new housing from an emerging middle class. Urbanisation is further driving the construction and mobility sectors. At the same time, the growing demand for energy is prompting governments to look at sustainable sources, such as wind and solar energy. mature and China’s emerging market needs; the facility in South Korea, which serves the local automotive and IT sectors; TPU R&D centre in Taiwan and the adhesives and coatings laboratories in China and India respectively. In addition, the firm works in tandem with research institutes such as the RWTH Aachen (Polytechnic School), Germany; Chinese Academy of Science; Tianjin’s Nankai University and Tongji University, Shanghai. The innovation hub will also be supported by a network of production sites in Asia Pacific, the biggest ones being in Shanghai, Map Ta Phut (Thailand) and Niihama (Japan). Furthermore, it will serve as a capability-building centre to attract local talent and enhance knowledgebuilding and transfer. The PRDC employees are expected to work in global cross-boundary teams, including colleagues at R&D centres in Europe and the US. Increased research spending in China In 2012, BMS spent EUR242 million on R&D, which is approximately 10% of the total Bayer R&D for polymer materials, and registered nearly 200 patents. BMS’s focus on China is easy to deduce. Though Japan and South Korea are leaders in R&D spending in Asia Pacific, Thomas said, “China is catching up with its peers due to increased spending. The country accounts for approximately 15% of the total global R&D spending and it overtook the US in 2011 to become the leading country where patents were filed.” He also said that R&D expenses for BMS in the country are expected to increase from 1.75% of the GDP in 2010 to 2.2% of the GDP by 2020.
allows manufacturers to produce a coated or skinned component in a one-step process, directly on the injection moulding machine (as opposed to multicomponent moulding). The above are just some of the innovations that BMS has launched, said Thomas in his presentation at the inauguration ceremony. Amongst the facilities offered at the centre are process evaluations of RHCM (rapid heat cycle moulding), MuCell physical foaming, DCDS (DirectCoating/DirectSkinning) and thinwall moulding. Future expansions include the addition of auxiliary testing devices, based on customer requirements, for the final products, adding on to the mould services already offered at the tooling shop. Various updates on green materials in the industry sector are testament that the green sector is moving at a fast pace. for several years, with global production capacity for these biopolymers, expected to more than triple by 2020, to an estimated 1.2 million tonnes. Many of the early applications used only the neat resin or were blends of the neat biopolymer with other polymers. Today, there is more focus on reinforcing these biopolymers with other natural fibres such as wood, rice husks, flax, hemp and others, requiring the use of polymer modifiers derived from renewable resources. The firm says both its products contain greater than 95% renewable content raw materials and says that the materials can be used as a tie layer in multi-layer extruded applications where a high renewable content is desired. Also in the US, bioplastics maker Cereplast has incorporated 51% post-industrial algae biomass in its Biopropylene A150D PP resin, while aiming for 100% algae content in three years. The injection moulding grade will be available in the second quarter of 2013. Cereplast claims the polymer has low odour and a medium to dark green colour that can be pigmented to a darker green, dark brown or black. The company says it is processable on conventional machinery and is well suited to thinwall applications. Another US resin maker Rennovia has developed a 100% biobased nylon 66 using its biobased hexamethylenediamine and renewable adipic acid technology. The new nylon is suited to automotive applications where its heat resistance is valued as well as in various fibre end-uses. Green Materials News Cars and toys from bioresins In recent research undertaken by Huntsman Advanced Materials, the firm says that it is now commercially possible to produce resins for industrial applications with a biobased content higher than 80%, when combining up to 100% biobased resins and up to 80% biobased hardeners. The firm developed the biobased epoxy resin used in the construction of BioMobile, a prototype vehicle founded in 2004. The vehicle has been updated over the years to integrate new biobased fuels and renewable materials, with its latest adaptation seeing the replacement of the remaining non-renewable structural components with renewable materials. T h e c o m p o s i t e b o d y, c h a s s i s a n d m o s t o f t h e structural parts of BioMobile are now made entirely from various vegetable fibre reinforcements impregnated with a specially developed epoxy system from Huntsman Advanced Materials, which contains over 50% biobased resin. Developed within the Haute Ecole du Paysage, d’Ingénièrie et d’Architecture de Genève, which is part of the University of Applied Sciences and Arts Western Switzerland, BioMobile’s fuel consumption is approximately 0.12 litres per 100 km and it now runs on X41, a biofuel made from organic waste. It was originally developed as an energy-efficient vehicle for competitions such as the Shell Eco-marathon, which challenges teams to go as far as possible using the least amount of energy. Meanwhile, the latest prototype car from SIM-Drive Corporation, a pioneering electric vehicle developer in Japan, features DSM’s Stanyl and EcoPaXX-based parts. Development of the SIM-CEL electric vehicle, which took around one year, involved close collaboration with 26 outside organisations, including DSM. SIM-CEL has a range of almost 325 km on a single charge and it can accelerate up to 100 km/hour in just 4.2 seconds. DSM contributed to the development of three parts for the SIM-CEL: a body panel in its EcoPaXX polyamide 410; a wheel cover center cap in the same material; and a heat sink for highly energy-efficient LED headlights in Stanyl TC polyamide 46. EcoPaXX polyamide 410 is 70% resourced from the castor plant. It is certified 100% carbon neutral from cradle to gate. In order to improve overall aerodynamics, the SIMCEL incorporates spats, or fender skirts, which cover the rear wheel arches. These are also made in DSM’s EcoPaXX polyamide 410, further contributing to the sustainability of the car, its low weight and aesthetics. Elsewhere, UK-based Axion Polymers has developed a variant of its high-grade recycled polymer, Axpoly r-PS01, which comes from plastics from refrigerators and will be used to make toys and other applications. The company says that its 100% recycled polymer is a testament to its ability to satisfy British Standard testing to BS EN 71-3, which covers the specification for migration of certain elements from within the plastics used to mould components of toys. Axion notes that it recently supplied 120 tonnes to a producer of moulding applications located in Asia. Axion is also working to satisfy the revised specifications for the toy safety standard, which are due to be announced in July. and other organic waste. It served food and drinks in fully biodegradable cups and plates made with its compostable Ecovio polymer and thereafter disposed these together with any leftover organic waste in compostable waste bags. These bags were then sent directly to a composting facility. BASF has already been involved in several composting projects in Germany, Canada, Thailand and Australia, said Hebert. The Thai project ran from 20092010. The pilot plant site was at the Kradangar District of Samut Songkhram Province. “Our projects have run successfully around the world since people have become more eco-conscious,” said Hebert, adding that the firm is working on introducing similar trial projects in Guangzhou. The compost generated from the pilot project will serve as organic fertiliser to be used in the Wanke community and on farms in Wuhan Xingzhou, reducing the need for chemical fertilisers and reducing soil erosion. Furthermore, Hebert says that could help to rejuvenate soil and grow better plants. “Compost allows plants to be grown with less water.” BASF says that 50% of waste generated is organic and that landfilling of organic matter is environmentally detrimental as it generates methane, a greenhouse gas that is 23 times more potent than carbon dioxide. As organic waste has a high water content, incineration is also not a suitable alternative as it requires significant amounts of energy and results in higher emissions of carbon dioxide. Furthermore, BASF says that if all organic waste in China were to be collected separately and composted, 45 million tonnes of carbon dioxide could potentially be saved. When asked about the costs involved, Haber said that BASF evaluates the total systems costs, such as the solution and environmental impact on the society. “A composting infrastructure needs to be put in place first and then we need to educate people to separate the compost waste. Our goal is to bring all the stakeholders together to discuss this, it is not a difficult solution to implement at all,” he added. or one of the new German production sites of the BMW i3 and BMW i8 vehicles, car maker BMW specified to all potential suppliers that any of the processes necessary to convey, dry and blend the different polymers in use, had to be energy efficient and self sustainable. Also, the output claimed would be tested and compared, to assess and subsequently determine the ranking of performance. Italian auxiliary equipment supplier Piovan, which was one of the suppliers selected, says that the testing period lasted six months and it had to compete with five major suppliers of auxiliary equipment. “Modula of Piovan was regarded by BMW as the best solution, for its efficient operation, energy utilisation, auto adaptivity and constant process conditions,” it says. operation is generally performed by circulating hot dry air inside a drying hopper. In the case of applications that involve a number of materials of different kinds, a central unit is commonly used to generate dry air, which is then distributed to a series of hoppers, one for each material type, through a duct system. As such, each hopper requires specific conditions for optimum operation (dry air flow, temperature and pressure) depending on the different material characteristics, such as the type, the required initial and final level of moisture, the hourly material consumption and the granule size. A safety condition is systematically adopted and the drying system is sized based on the most critical processing parameters, such as maximum material consumption, at maximum temperature, with the highest airflow. “This basic model goes against any principle of energy efficiency and certainly does nothing to reduce or optimise the system running costs,” adds Piovan. Galore of composites Carbon fibre is heralded as the millennium’s new breed of high-strength materials that has found broader applications, from the aerospace to the automotive and recreational segments. Meanwhile, updates are provided on suppliers, tooling technology and composite fibres. Darmstadt, will address automotive, renewable energy and aviation applications Germany-headquartered Bayer MaterialScience (BMS), has opted out of the carbon nanotube (CNT) technology. It says it has passed on the knowledge gleaned over recent years to other companies and research institutions within the Innovation Alliance Carbon Nanotubes, which counts BMS among its 90 members. CEO Patrick Thomas says though the company is convinced of the huge potential in CNTs, the potential areas of application that once seemed promising from a technical standpoint are currently either very fragmented or have few overlaps with the company's core products. Nonetheless, this know-how provides an important basis for a possible later use of CNT, for example in the optimisation of lithium ion batteries, Thomas said. In other news, US-based materials engineering company Morgan Advanced Materials has acquired the business formerly known as NP Aerospace, a manufacturer of composite products for defence and other applications. To be known as Morgan Advanced Materials – Composites and Defence Systems – it will be based in Coventry, UK. “As an armour company, we have the unique ability to optimise the performance of ceramic and composite materials, as well as designing the integrated armour system to maximise protection for a given weight – a key benefit in the field," says Duncan Eldridge, Managing Director of Morgan Advanced Materials. New composites in the market Belgian fibreglass maker 3B has introduced a new glass roving specifically designed and formulated for acrylic resins to allow for the manufacture and production of glass-reinforced PMMA composites. The sizing for the new glass roving was developed in collaboration with French chemicals firm and acrylic producer Arkema and engineered fabrics manufacturer Chomarat. Meanwhile, Chomarat is extending its line of carbon reinforcements with C-Weave SP, a new line of spread carbon fabrics for composite parts with high aesthetic performance requirements. It is especially for the high-end automotive, sports/leisure, luggage and telecommunication markets. Lanxess steps up its butyl rubber footprint in Asia German speciality firm Lanxess has invested over EUR500 million to upgrade its global butyl rubber manufacturing units in Canada and Belgium and build a brand new facility in Singapore, adding around 200,000 tonnes/year of capacity in total. It is expecting to focus a large part of it to the expanding Asian economies, which account for about a quarter of its total group sales. The Asia Pacific region is also a prime mover for the mobility megatrend growth, and thus is propelling demand for butyl rubber, which is estimated to have a growth of 6% a year. anxess’s butyl rubber sales in Asia represent more than 50% of its worldwide sales of the rubber of over EUR500 million. The region has the strongest growth potential, with increasing passenger mobility as well as a growing middle class and improved access to medical care, thus underscoring the urbanisation trend, says the company. Added to this is the global trend of radial, tubeless truck and bus tyres, all factors that should bode well for the rubber material market. 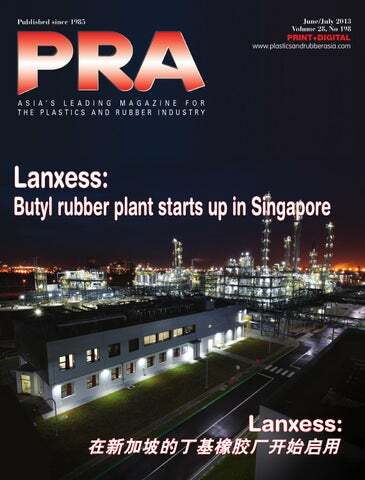 Debut of BTR plant in Singapore The recent opening of Lanxess’s butyl rubber (BTR) plant in Jurong Island, Singapore, marks its pioneering presence in the region. The Singapore facility, which is claimed to be the most modern of its kind in Asia, joins Lanxess’s existing butyl rubber plants in Sarnia, Canada, and in Zwijndrecht, Belgium, both with nameplate capacities of 150,000 tonnes/year. This means that the speciality chemicals company now has three state-of-the-art BTR facilities on three continents. The debuting plant’s premises for premium halobutyl and regular butyl rubber production feature 3,500 tonnes of steel, 350 km of cabling and 80 km of piping. The EUR400 million plant has also created about 160 highly qualified new jobs for locals. The plant was engineered and constructed by Foster Wheeler Asia Pacific on a 150,000 sq m plot on Jurong Island, leased from the JTC Corporation, a statutory board under the Singapore Ministry of Trade and Industries. And although the supplies are not transportable within the island, they can be “transferred” via pipelines and through the use of a highly skilled workforce. Last year, Lanxess also started construction of a new production facility for neodymium-based performance butadiene rubber (Nd-PBR) on Jurong Island. The direct proximity of these two plants creates valuable synergies for the company, for example, through joint infrastructure and logistics. Commander also mentioned that Lanxess is able to operate on a 100% ownership in the country, meaning that it does not have to share its knowledge and proprietary technologies with other parties. Another reason for choosing Singapore for the plant is its ideal location. “Singapore is now the hub of our Southeast Asian operations, taking its place as an even more important pillar of our global rubber production activities,” he said, adding that the company had also moved its butyl rubber headquarters from Switzerland to Singapore in 2010. China is a growth backbone China is undoubtedly the current biggest market this side of Asia, accounting for about half of Asia’s 50% demand of the overall global butyl rubber sales for Lanxess. The country, along with India, is considered by Lanxess to be the growth engine for mobility. China’s passenger car ownership is expected to more than triple to 450 million units over the next 15 years, with about a 10% CAGR for both countries from 2012 to 2013, citing data culled from economic and business consultancy LMC International’s 2012 report. And while the current slow down in China may seem to be a deterrent for industry producers and manufacturers, the German chemicals firm views the situation as temporary. China may no longer grow between 11%-12% and may only achieve a target of 7% this year, said Commander at the inauguration of the Singapore facility. The decline, however, still points to a healthy growth, Commander continued, adding that many economies in the world would “still be happy” to reach that growth percentage. The overall sluggish Chinese economy was also a point raised by Breuers. He echoed and agreed with Commander that the company views this as a temporary phase as the country is in an economic transition. 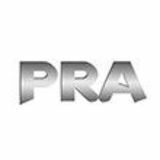 “It may be hard to predict for how long (the sluggish economy situation) it will last, but we see it recovering in the first half of 2013 through 2014,” Breuers told PRA during the press conference. Heitmann also emphasised in his remarks during the opening ceremony that Lanxess “takes a long-term view of things” and that “(it is) not discouraged by the current weakness in demand, which we view as temporary.” The Singapore BTR plant is, thus, now in a better position to serve the region, said the Lanxess officials, including its topmost customers from China, where the company has ten wholly owned subsidiaries, three joint ventures and six major R&D centres. It will also serve India, where Lanxess has manufacturing units for six of its business units. Reaching across non-tyre segments Rubber also figures in various other applications and Lanxess’s innovations span across industries that can benefit from the application of its high-end rubbers. The firm said that halobutyl rubber, which is ideally used for inner liners of modern tyres, can also be used in pharmaceutical closures due to its non-toxicity, physical and chemical properties, good resealing after puncturing and resistance to ageing. The special-purpose rubber is also required by law in some Asian countries, for example in China, for use in pharmaceutical applications. The country’s ranking, by consumption, in the global pharmaceutical sector rose from ten in 2001 to seven in 2009. It is expected to rank second place, after the US, by 2020. Examples of halobutyl rubber-made closures are those used for infusion containers, pipette assemblies and plungers for prefilled syringes. Some of the world’s biggest pharmaceutical closure manufacturers are based in Asia, hence, it is no surprise that Lanxess has set up a plant for halobutyl rubber in Singapore. Other applications for butyl rubber are protective clothing, shoe soles, adhesives and chewing gum. Its impermeability to gas and resistance to chemicals has also proven valuable in vehicle air conditioning systems and tank linings. Moreover, Lanxess has also developed a new butyl rubber product called butyl ionomers, which it says will launch new applications for butyl rubber. Apart from sports grips, improved adhesives and sealants, pharmaceutical closures (or for applications where pure rubbers are needed), and medical adhesives, butyl ionomers are suitable for use in antimicrobial coatings. Commander explained that the antimicrobial application for butyl ionomers is especially helpful even in everyday requirements, such as the rubber handgrips of supermarket pushcarts. Moreover, butyl ionomers can improve the grip on golf clubs, said Commander. The Singapore plant will be producing both regular and halobutyl rubbers. The latter, the company says, is a more complicated material to manufacture but provides better value to customers and demand for it is growing at a faster rate than regular butyl. Furthermore, Lanxess has recently developed new technology to incorporate bromobutyl rubber, a type of halobutyl rbber, into tyre treads. This is done to enhance tyre safety by increasing the tyre’s wet grip and reducing its braking distance. It likewise makes tubeless tyres possible, which Lanxess says “is extremely important because radialisation is driving the truck and bus market segments in both China and India.” Notwithstanding this, the company also sees the market for tyres and inner tubes to continue to represent the leading use for regular butyl and halobutyl for years to come. The company also claims to be the only supplier of butyl rubber that is used for the production of chewing gum. According to Lanxess’s data for butyl sales by end-use applications, the tyre segment accounts for the largest share at about 75%. The remaining goes to non-tyre segments, including pharmaceutical (approximately 10%), chewing gum (approximately 5%) and other rubber applications (such as adhesives and sealants, condensers, caps, membranes and bladders) at about 10% of overall sales. Riding the wave of radialisation There is also a growing trend towards the use of radial or tubeless tyres for buses and trucks in China and India. Based on Lanxess’s presented data, China’s focus on improving road infrastructure is fuelling the trend of radialisation of truck tyres, whilst India shows a high growth potential, given its 17% radialisation rate for truck and bus tyres in 2011 and 2012. Partnering for joint gains At the recent Chinaplas 2013 show, US companies displayed their technology prowess and updates to products, with materials suppliers tying up with local Chinese manufacturers to showcase technology at a localised level. US Machinery and Technology Over a period of three years, the US$2.9 billion firm has acquired a manufacturer of glass and carbon fibre reinforced polymers and advanced composite products Glasforms, Spartech (custom sheet and rollstock and packaging business) and Colormatrix. “PolyOne has been taking the cash it makes and investing it in acquisitions. We will continue on this path,” said Crist. The investments, which tie in with PolyOne’s transition from cyclical commodity markets into speciality applications, have been paying off. In the first quarter of 2013, its revenue rose 7.5% to US$801.1 million from the year-earlier quarter, attributed to its speciality businesses that delivered a 34.4% increase. “Spartech (now known as Design Structures and Solutions) is very much like what PolyOne was in 2005; while Glasforms will use PolyOne’s global footprint to expand.” Crist also commented that “integration is a challenge when products are similar but since Colomatrix offers liquid colour solutions and PolyOne colour masterbatch, both are in different spaces.” Meanwhile, regarding the acquisition of Spartech, which is a sheet thermoformer and would mean that PolyOne will be competing with its customers, Crist said, “Conventional wisdom will say there is a conflict but actually we have found little overlaps and more synergies globally." At Chinaplas, it showcased a global collaboration with Netherlands-based Xindao and its Chinese design studio XD Design to increase the content of renewable resources within the new XD Design Sunshine Solar Charger. The moulded casing components are made from PolyOne’s reSound biopolymer, which Xindao estimates will reduce the CO2 footprint for this product by as much as 35%. The 30% ABS and PC bio-derived polymer is not universally applied, Crist agreed, due to the higher price. “We are only targeting the high-end markets,” he added. PolyOne also unveiled its new InVisiO colour and design services, which are tailored to help brand managers and designers evaluate colour and design alternatives to accelerate the product development process, strengthen brand equity and build marketplace excitement. DuPont places emphasis on R&D in China DuPont Performance Polymers plans to expand its Shanghai R&D centre later this year, further enhancing its application-development capabilities with the addition of 200 staff (to total 500) and doubling the space. Woong Chung, Global Technical Services Manager, said 50% of new materials that are offered globally are developed by the local Chinese team. “The centre was set up two years ago for automotive part testing, but now we will expand our focus to new materials, new designs and prototyping.” In terms of design capabilities, Woong says DuPont has 20 CAD/CAE designers in the region, claiming that it is the only firm providing this full scope of design support. “We strongly believe in design solutions to add real value to customers and we look forward to continuing our collaborative relationship with the automotive, industrial and consumer segments in China.” In the automotive sector, the focus is on lightweighting, efficiency in automotive components for lower CO2 emissions and fuel economy, with downsizing of engines and focus on hybrid and electric cars as well as total system costs. New advance products for automotive applications include the Zytel Long Chain Polyamides (LCPAs). ith 30% of its business coming from Asia Pacific, it is no surprise that extrusion and converting technology systems manufacturer Davis-Standard is honing into the region, by expanding its manufacturing footprint capabilities and after sales market. Last year, the company set up a 4,300 sq m facility in Suzhou, China, to offer sales, technical support and aftermarket service. “We will add on research capabilities by the end of this year,” said Fred Pereira, President of the Asia Pacific operations. In aftermarket service, Davis-Standard will utilise the technologies of Circonix, a company it purchased last year. It specialises in drive and control system retrofits for converting and extrusion equipment. “Acquiring Circonix extends Davis-Standard’s capabilities and supports its ability to upgrade PLC, drive and mechanical systems on thousands of existing installations worldwide, including non-Davis-Standard brands,” said Pereira. To reduce time to market, the firm will also stock up parts at the Suzhou facility, which is primarily a service centre, and also upgrade it to offer retrofitting services. And while Suzhou is only manufacturing components at the moment, the firm intends to start producing its Super Blue and Euro Blue extruders by the end of 2013, according to Pereira. The firm also intends to double its business in Asia Pacific, by expanding its work force in China and launching new products. It recently incorporated employees from Taiwan-headquartered Lamex Trading, an engineering trading company specialising in extrusion that has represented Davis-Standard in China for 11 years. Furthermore, Pereira said the firm is pouring investments into its “global entity transformation” process. “A part of the transformation is in China since it has the fastest growth in the world.” Said President/CEO Bob Preston, at a press conference a day before Chinaplas, “We expect to transform every aspect of the company to drive productivity and differentiate it from the competition. We already have a large global base with 40,000 installations, six facilities, three R&D centres, 14 sales offices and sales of over US$300 million.” He went on to say, “The bottom line is that we want to have a global advantage.” Diverse product range; packaging a targeted market What sets Davis-Standard apart is its range of product offerings. “We have ten diverse converting platforms. No other company offers this,” Preston explained, adding that in the US, the firm is known as a “one-stop shop”. Around 48% of its portfolio addresses the packaging sector, followed by pipes/profiles (12%), medical (8%), green markets for solar energy (10%) and automotive (4%). According to Bob Florence, Executive VicePresident of Global Sales and Marketing, the firm is a leader in aseptic packaging lines, with China being its largest market. At Chinaplas, the company showcased its new dsX flex-pack extrusion coating line, a preengineered line that can be delivered in six months. Said Florence, “The packaging market is large and we want to cover all aspects. We’re primarily a custom machine builder for the high end market but our strategy is to move to the lower end of the market. We will do this by standardising our technology.” The dsX flex-pack includes an unwinder; corona treaters; extrusion laminator; gravure primer coater dryer; pull roll with nip; winder; electrically heated, air-cooled Davis-Standard extruder with advanced feedscrew design; downstream, carriage and Siemens drives and controls. US Machinery and Technology Advanced computer technology includes DS APC (automatic profile control) and a DS5 computer to allow for remote access for troubleshooting and updating over a secure internet connection. “It is competitively priced with a fast ROI, on average within six months,” claimed Florence. And while the line is currently designed and built in Germany, the intention is to build it in Suzhou by 2014, for the Asian market. The firm is already looking ahead. “We will double the size of the Suzhou facility by 2014, or find another facility,” said Preston. Compact medical line Along the lines of offering a machine that suits the local needs, Davis-Standard also introduced the dsX medical tubing line, designed to produce single/multi-layer IV drips, catheter tubes and fluid delivery systems. Said Preston, “The Chinese healthcare sector is upgrading and processors are buying more high tech lines now. It is a fragmented market with lots of small players who are not looking for large machines.” The compact medical tubing line offers a smaller footprint for clean rooms. It also features a language-specific control system. The line’s co-extruders are engineered to provide processing versatility and value, enabling processors to use materials ranging from PP to fluorinated ethylene polypropylene (FEP) with a simple feedscrew change, says the firm. It also includes a melt pump on each extruder for processing thermoplastic polyurethanes (TPUs), nylons and other medical grade resins. The line is displayed at Davis-Standard’s Suzhou facility, to allow customers to run trials. DavisStandard also offers a medical tubing R&D line at its technical centre in the US. China renews its draw factor Chinaplas 2013, held from 20-23 May in Guangzhou, saw a total visitorship of 114,103, up by 4% from the 2012 show in Shanghai, with 27% of visitors coming from overseas, compared to 25% in 2012. With 22% more space this year, the show continues to grow. Foreign companies still view China as a bright spot in a gloomy world economy, even as the country grapples with a slower economic growth (with the International Monetary Fund recently saying that it could miss its 7.5% growth target this year), rising labour costs and regulatory barriers. Country Focus Also on the cards is the expansion of the logistics network to include warehouses in Tianjin and Ningbo by the end of 2013, adding on to the existing Shanghai and Guangzhou logistics hub network. Meanwhile, German extrusion machinery maker Windmöller & Hölscher (W&H) is setting up an office in Shanghai to build up its presence in China, said Philip Elder, W&H Sales Manager for China. He said that the office will cater to sales, service and maintenance, adding that the firm is committed to the Chinese market and to Asia. “We will cater to the growing market for flexible packaging in China,” he said. The firm was promoting its Filmex cast film line and had sold an 11-layer line for barrier film last year. He also feels that the market and customers are becoming more mature and therefore has great confidence in the Chinese market. “Because private consumption will continue to grow at a rapid pace, W&H equipment will be needed to satisfy this demand in a way that meets the investors' increasing requirements for better products, less waste, faster change over times, higher productivity and less energy consumption,” he said. Kabra and Plastiblends make premiere showcase Indian extrusion machine maker Kabra Extrusiontechnik (KET), a part of the Kolsite Group, together with sister company colour and additive masterbatch producer Plastiblends made their premiere showcase at the Chinaplas show. “We are here to create a brand presence,” said Chairman SV Kabra speaking to PRA during the show. “It is the first time that we have participated in Chinaplas and the response has been encouraging.” When asked if the firm would set up a plant in China, Kabra replied, “It is a possibility. We could collaborate with a local manufacturer.” The firm already owns a stake in US-based extrusion machine maker Gloucester Engineering (GEC). Kabra and GEC formed a joint venture, Kabra Gloucester, in 2009, and later in 2011, Kabra bought a 15% ownership stake in GEC, to manufacture lower cost blown film lines in India. But the latter has been through difficult times, especially when it had to restructure its business in 2010. “It was dormant for a few years but it has been doing well since it changed hands (in 2011, GEC was purchased out of receivership by private equity firm Blue Wolf Capital Partners),” said Kabra. In fact, GEC President Carl Johnson said recently that the firm is coming off two consecutive years where it has doubled its annual sales. “By recapturing customer confidence, the company’s backlog has steadily increased and management is forecasting an additional 35% growth in 2013,” he said in a press release. customers are beginning to pay more attention to product quality,” said Marketing Supervisor Rosemary Tan. When asked about the Asian market, she said, “Demand is relatively stable. In the Southeast Asian market, Battenfeld Cincinnati provides an efficient and stable international advanced level of equipment to firmly occupy the leading position in the high-end market.” The firm’s other markets are South America, Middle East and Africa, as well as Europe, which Tan said is in the doldrums, adding, “But we have a strong market leadership in Russia and the CIS.” This year, the firm expects a 35% increase in turnover, compared to 2012. “Last year, we secured 80% contracts from the high-end market for pipes and window profiles,” Tan added. At the exhibition, it showcased its seventh generation conical twin-screw extruder conEX series extruder, which has been upgraded with the AC inverter motor, allowing for 20% lower energy usage and without the need to replace carbon brushes thus allowing for a maintenance-free operation. Another model shown is the single-screw extruder extruder solEX series for producing PE-HD and PP pipes. PE80 and PE100 materials are used for non-ferrous pipe extrusion, with a production diameter from 20 mm to 2,500 mm for water and gas pipes, explained Tan. “The machine can also be used to produce PP drainage and sewerage pipes and corrugated pipes.” When asked how Battenfeld Cincinnati distinguishes itself from the competition, Tan replied, “It has always been adhering to industry-leading extrusion technology solutions with the launch of equipment that is energy saving and environmentally friendly, providing greater yield with more energy savings.” Research a core focus of converting equipment supplier Chinese-Swiss joint venture (with Polytype Converting Group of Switzerland) Shantou Huaying Soft-Packing Equipment Plant supplies specialised printing and coating equipment to China. Country Focus At Chinaplas, it showcased its ink tray trolley. “It features an independent trolley structure, with accurate installation, a special independent active roller to reduce ink bubbles and improve the printing performance,” said General Manager Sarah Xu. The company hinges on R&D with its Guangdong Printing & Coating Engineering Technology R&D Centre (co-founded with Shantou University and Shantou Academe of Light Industrial Equipment). “Huaying focuses on technical innovation and development. We are also certified in accordance to the ISO9001:2008 quality management system and are CE-certified,” she added. She went on to say, “China is a huge potential market for the flexible packaging industry that continues to develop, especially with the state, food and drug safety regulations and other packaging-related regulations arising from customer demands.” Xu also commented that demand for more efficient equipment is growing in the country and the company expects to secure more sales. “Over the past decade, Southeast Asia has become our most important overseas market but in recent years, countries like Indonesia, which has been subject to government instability, yielded varying degrees of decline. However, this year, India and China have stabilised, and we expect further growth to come from the Indian market,” she said. Huaying continues to firm up business in Indonesia through its distributor PT Panverta Cakrakencana. As for the European market, Xu also reiterated that initially, Chinese products generally did not comply to the standards. “But if China continuously improves the technological content of its products, demand in Europe should increase accordingly. This will be our long-term goal,” she said, likewise mentioning the potentials of the Russian and CIS markets. Expecting more sales in the coming year, the firm is pining for a certain level of growth, yet, mulling that the domestic and global economy could weigh down on this goal. Opportunities from a cost and quality-conscious market Homegrown maker of extrusion equipment for middle to high-end customers, Useon (Nanjing) Extrusion Machinery, is beginning to notice a changing landscape in the Chinese market. “It is transforming from a price to a qualityconscious (market), and this change provides a good opportunity to those who focus on quality and innovation,” said company spokesperson Cliff Zhang. But he also points out that the change poses a “big challenge to those whose main strategy is focusing on pricing.” He added, “Generally speaking, Southeast Asia is still a price-conscious market and is attractive for companies who employ price as their strategy.” But he adds that the European market, one of the firm’s target markets, is a highly-competitive base. “It puts more weight on quality and safety issues than price. To enter this market, a machine supplier will encounter many restrictions in design, safety issues and manufacturing standard,” said Zhang. The Russian market, on the other hand, is a typically polarised one that has high and low-end and a bit of middle-class market characteristic. Which product to fit the market depends on a company’s own character, said Zhang, adding that this year the company expects 20% increase in sales. Set up in 2006, Useon makes extruders and at the show it exhibited a new series of high torque twin-screw extruders. It also introduced the direct extrusion technology with a twin-screw extruder and foam extrusion technology. For the twin-screw extruder, it has raised the specific torque up to 10.6Nm/cm3; with some models able to reach at 14.5Nm/cm3, while the speed has been brought to 800 rpm, which would be a new benchmark for a Chinamade twin-screw compounder, said Zhang. With the direct extrusion technology, the twin screw extruder is employed into the extrusion process, reducing the energy consumption substantially by up to 35%. In foam extrusion, traditional HCFC has been replaced with supercritical CO2 as foaming agent, which not only cuts down the material cost, but contributes to a green product, said Zhang. Enhanced solutions for the packaging market The thermoforming process, a part of the US$22 billion global plastics machinery industry, has remained intact as its counterparts, injection moulding and extrusion, have fluctuated over the years. Gains are stemming from the versatility and cost efficiency of thermoforming, combined with a healthy outlook for the domineering packaging sector. Plastic usage dominated by packaging The growth of thermoformed products will be supported by resin, additive, process equipment and computer-aided engineering enhancements, resulting in greater customisation, sharper detail, higher performance and quality standards, and an expanding array of potential applications. Meanwhile, US firm BCC Research says that the global market for thermoformed plastics is expected to increase from 3.1 million tonnes in 2012 to 3.8 million tonnes by 2017, a 4% compound annual growth rate (CAGR). The packaging segment dominates the sector, accounting for 80% of the total volume consumed. This sector is expected to grow to 2.72 million tonnes by 2017, at a CAGR of 4%. Thermoformed trays to push market sector US research firm Freedonia Group says demand for trays in meat, poultry and seafood packaging is expected to increase 3.9% a year to US$860 million in 2015. The growth will be driven by a change in product mix towards larger and more expensive foam and rigid trays as a result of the increase in the market share of case-ready meats and the increasing popularity of processed ready-tocook meat, poultry and seafood products. Freedonia projects that demand for foam trays will progress at a slower pace than non-foam trays because of market maturity and intensified competition from non-foam trays. Tray advancements are expected to be restrained by competition from flexible packaging formats, such as pouches and bags. Meanwhile, manufacturers are also moving more to in-line thermoformed rigid or semi-rigid formed packaging. Nevertheless, foam trays will continue to be the backbone of the meat packaging sector, with further growth coming from case-ready applications. Benefits of foam trays include low cost, impermeability to moisture (which delays spoilage and bacteria growth), design flexibility and improved cushioning. The foamâ&#x20AC;&#x2122;s insulation properties also safeguard products from freezer burn. Many retailers prefer case-ready systems, including foam trays and film overwrapping, because these products give the impression of professional wrapping, Freedonia explains. At the same time, the case-ready format removes labour costs associated with in-store meat cutting and packaging and it permits retailers to place meat in display cases as needed, which decreases losses due to spoilage. The foam tray demand will also be reinforced by speciality trays, such as barrier foam trays for case-ready meats. Already on the market are trays that provide increased oxygen and moisture barrier properties, trays designed to absorb blood and other liquids, and pre-padded foam trays with a foam pad glued to the inside of the base. Sustainability in packaging Sustainable packaging trends are also expected to impact foam tray demand, especially conventional foam PS trays, since some cities around the world are already banning their use, Freedonia says. In reuse of material, US-based MicroGREEN Polymers, which was founded by graduate researchers at the University of Washington and funded by angel investors and the Washington Research Foundation in 2006, has introduced a patented Ad-air solid-state microcellular process that uses non-reacting, recycled carbon dioxide gas to thermoform recycled PET rolls into trays and cups. The production process makes the PET 45% lighter, without using chemical blowing agents, and because the plastic is not chemically altered, it can be recycled at the end of its life. The firm also won the DuPont Award for its CPET trays and cold party cups, which are respectively 70% and 60% less dense, resulting in lower thermal conductivity. This allows consumers to handle CPET trays straight from the oven without being burnt and keeps the beverage in the cups cold, while providing environmental benefits. Meanwhile, Germany-based BASF has introduced a compostable Ecovio T2308 grade for thermoforming trays and cups. The plastic exhibits similar mechanical properties to those of amorphous PET, but differs by virtue of its compostability and its high content of PLA. The content of Ecoflex, which is BASF’s compostable polyester, allows for a material that is not too stiff or brittle, allow for less damage to products during transportation and storage. The Ecoflex component also ensures a balanced stiffnessto-strength ratio and BASF’s new Ecovio sufficient low-temperature grade is translucent impact strength. Of opportunities and drivers that keep it in shape The medical devices industry has been hit by high healthcare costs and weakened markets, yet has generally remained unperturbed in the long term, due to the vast opportunities for growth offered by emerging medical trends, says Angelica Buan in this report. CPP line to be a boon for Malaysian film maker Faced with a competitive market structure and falling prices for biaxially oriented polypropylene (BOPP) films, Malaysia-based San Miguel Yamamura Plastic Films (SMYPF) has invested in a new CPP (cast polypropylene) film line from Austrian extrusion machine supplier SML. aid General Manager of SMYPF, Tang Han Lock, “We expect to increase our turnover by 50% as this line has an output capability of 5,000 tonnes/year. Currently, our plant is running at full capacity with our other lines (for BOPP and CPP) and we export 15% of our output.” He also said the firm has an average turnover of US$24 million a year. SMYPF is investing US$10 million in the new expansion, which includes the line and other equipment like metallisers and slitters. General Manager of Sited in Malacca, around 120 km south of the SMYPF, Tang Han capital city of Kuala Lumpur, SMYPF is part of San Lock, says that the Miguel Yamamura Packaging International (SMYP), company is the only one which is a joint venture between Philippines-based undertaking metallised San Miguel Corporation (SMC), Southeast Asia's film in Malaysia. “It is largest food and beverage and packaging company, a growing market and and glass/PET bottle maker Nihon Yamamura Glass we cannot supply to (NYG) of Japan. NYG took up a 35% equity stake in the whole country,” he SMYP in 2009, to “diversify and expand its markets added since the packaging market is shrinking in Japan and developed countries offer better opportunities”, according to Tang. The plant where SMYPF operates from has a history dating back to 1975 when it was set up by a few local individuals. It was subsequently taken over by locally based conglomerate Hong Leong Industries and sold to SMYP in 2005. First line in 20 years The CPP line is the firm’s first machine installation in more than 20 years and its second CPP line. The first CPP line, from German supplier Reifenhäuser, has an output of 2,500 tonnes/year. “We will also upgrade this line and aim for a total output of 7,500 tonnes/year of CPP,” said Tang, adding that this will result in an almost 200% increase in CPP output for the firm. SMYPF also operates two BOPP lines, which were installed by Germanybased Brückner in the 1980s. “The lines have a width capability of between 4-4.5 m and a capacity of 8,000 tonnes/year,” explained Tang. Though the BOPP film sector has been one stationery of the most successful of the packaging market, 15% having grown from a specialist replacement for lamination cellulose film to a market of around 6 million 12% tonnes in 2011, it has been slowing down in the past few years. According to UK-based AMI Research’s study, the dynamics of the industry are changing. “In the developed markets of Europe, the US and Japan the markets are food slowing down while producers rely on an 31% ageing asset base to manufacture films,” says AMI. Processor Report As for CPP film, Asia has the highest market volume globally, says Gerald Ausweger, Managing Director, SML Machinery Far East. “In 2005, the market volume was 1,138 kilotonnes and this is expected to increase to 1,955 kilotonnes by 2015. It is growing at a rate of 7% a year in Asia,” he added. Of the total output produced by SMYPF, half is metallised using equipment from Germany-based Leybold. The firm will be adding on metallisers from UK supplier Bobst Group (with the new CPP line). “We are the only ones providing metallised film in Malaysia,” said Tang. When asked how the management came to a decision on the selection of the new line, Tang explained, “We were meticulous in our selection. We bought CPP film from a supplier in Indonesia that is using an SML line. We found the quality to be consistently good.” Austrian machine suppliers This is also the company’s first Austrian line, Tang said, adding, “We vouch for the reliability of European machines since they are of good quality and span a long period of time (as can be seen from the Brückner and Reifenhäuser machinery).” He also added that the choice of a machinery supplier “depends on the belief and philosophy of a company, as well as the affordability factor!” Another reason for the purchase of the machine is because SMYPF is targeting the export markets, and it expects to increase its exports to 60% with the new CPP line. A target market is Japan and for this reason the firm is putting in a place a dust-free facility for the new line to meet the stringent requirements of the market. “We are unable to meet both the domestic and export demand with just one CPP line,” explains Tang, adding that even though there is an oversupply of CPP film, prices for CPP film are holding, unlike BOPP film. “The new line will fill the gap of an average 3,000 tonnes/year that is required by local converters who are currently importing from Indonesia and Vietnam,” he said. As for BOPP film, Tang says the local demand is stable. “We cater to a niche market of medium-size converters and are assured of local support for our BOPP film, even with the slowing global market,” he added. One such converter that SMYPF caters to is sister company San Miguel Yamamura Printing and Packaging that is located in Shah Alam, Selangor. The firm also has a recycling line from another Austrian machine supplier, NGR Recycling Machines. “This line produces an output of up to 150 tonnes/month. The regrind is sold to woven bag and raffia string makers,” said Tang, adding that the regrind is highly in demand with local manufacturers. “We adhere strongly to our social responsibility and ensure that all of the packaging material is reused. We segregate our waste for recycling and reusing it.” The 160-staffed SMYPF operates a three shift operation. The new facility to house the SML line is currently under construction, with the line to be delivered in October and full start up expected early next year. Steady demand to accelerate growth In a reality check, analysts are lowering their expectations on China’s rebound for post-crisis recovery, settling instead for a slower growth rate. The steady demand in the machinery sector, a backbone of the country’s economy, may just accelerate the growth rate. But local companies interviewed at the Chinaplas show in Guangzhou in May expect recovery to be aided by export markets while international firms expect the demand for high-tech machines in the country to push their sales. Targeting the export markets he recent Chinaplas show conjures an actual, albeit, microcosmic arena for the country’s machinery industry. Machinery manufacturer China Haitai Plastic Machinery says that China will remain the world’s largest injection moulding machine production and consumption market for a long period of time. Noting that Russia is an emerging market, a spokesperson said that the foreign market, in general, is growing rapidly; and Eastern Europe remained a good market “despite the lingering Eurozone crisis.” When asked about the company’s growth, he said, “We expect a 50% increase this year.” And though it has business in most of Southeast Asia, it plans to focus on strengthening its presence in Thailand and India. At the show, the firm displayed three upgraded versions of its machines: a multi-colour moulding machine, hybrid machine and a second generation precision servo energy-saving machine. Another exhibitor, Guangzhou-based Borch Machinery says it is taking advantage of the steady growth and acceptance of Chinese machinery in the Asian market, mainly in South Korea, to expand its product range. Overseas Division Manager Haiyan Ma said that the company has enhanced the quality of its machinery to compete with South Korean machine makers LS Mtron and Woojin Plaimm. Calls for upgrading machinery standards hina’s plastic product output expanded 11.5% in the first four months of this year, two percentage points higher than the country’s overall industrial output growth, but slowed down from the 16.9% in the same period last year, according to a report from the China National Light Industry Council. The association says the plastics industry has “entered a period of reasonable growth after years of fast development.” During this period, Chinese plastic producers raked in RMB532.7 billion and the country exported RMB16.8 billion worth of plastic products, up 23% compared to last year. Meanwhile, the China Machinery Industry Federation says that structural changes are needed to trim off excess capacity, especially at the lower-end of manufacturing. However, it says that there is not enough capacity in the high-end manufacturing sector. The segment is also veering towards moving up the value chain to remain competitive both in the domestic market and internationally. And many local-based factories are producing machines for export, which are subject to quality standard compliances. German association Euromap, during the Chinaplas show, said that China-made machines that are imported to Europe do not comply with the EU standards. This observation is not just singling out China, the group stressed, but it, together with several trade associations, is batting for a more stringent inspection programme. According to the Italian plastics and rubber machinery trade group Assocomaplast, its inspection programme has found that in the last five years more than 90% of the imported machinery failed to meet safety standards. Thus, Euromap is amenable to a Europe-wide enforcement of the Italian programme since there have been reports of importers avoiding Italian ports and rerouting machinery to other countries with less stringent inspections. And once inside Europe, the machines are transported by land into Italy. R&D and nearly US$20 million of investment, France-headquartered metal moulding firm RocTool has begun selling its moulding processes under license and has tripled its turnover in a span of two years, from US$2 million in 2010 to more than US$6 million in 2012. This year, the company has opened two subsidiaries in the US and in Taiwan, adapting its Heat & Cool technologies to moulding metal for plastic and composite injection moulding. •	Taiwan-based 3D CAE simulation solution provider CoreTech System (Moldex3D) and German fluid injection technology supplier PME fluidtec are to develop what they say will be “a truly representative CAE simulation tool for fluid injection moulding.” PME fluidtec is a specialist precision engineering company in the field of fluid injection using water or gas cavity pressure technology with over ten years experience. It says that the technology enables greater freedom of design, faster cycle time, material savings, weight reduction and cost savings. The companies will announce enhanced capabilities soon. •	MarketsandMarkets, a US consulting group, says that global demand for automotive plastics will reach US$46 billion by 2018, with a growth of 13% a year between 2013 and 2018. The firm also says that 50% of automotive plastics usage comes from Asia, with the European market consuming 28%, followed by the US at 11.3%. PP takes up a large chunk of resins used at 37%, due to the drive to reduce vehicle weight to improve mileage. expected this year, against concerns about the health of the world economy, said Stephen Evans, Secretary-General of the Singapore-based International Rubber Study Group (IRSG). “The issue is there is plenty of inventory around as everybody reports, which more than covers an increase in growth. But we expect our annual projection of growth to be marked down slightly in response to the lower GDP forecast by the International Monetary Fund (IMF),” he said in a rubber summit organised by the group in Singapore. In August last year, IRSG said global demand was likely to rise 4% year-on-year to 27.7 million tonnes in 2013 as consumers start rebuilding inventories. IRSG bases its estimates on IMF’s economic growth forecast and the latter has trimmed projections for global economic growth for this year, to take into account sharp government spending cuts in the US and the latest struggles of recession-stricken Europe. The IMF cut its 2013 forecast for global growth to 3.3%, down from its January projection of 3.5% It also trimmed its 2014 forecast to 4% from 4.1%. •	Indian firm Apollo Tyres has set up its second export hub in Thailand, after Dubai, to cater to the ASEAN region, contributing 40% to the company’s overseas income. It also recently opened a sales office in Bangkok to serve the ASEAN region. Zone I, which includes India, Middle East, ASEAN and the Asia Pacific region, has brought in 67% of the company’s US$2.5 billion turnover. The size of the commercial vehicle tyre replacement market in ASEAN is 6 million units/year. The fastest growing is the 22.6 million units/year passenger vehicle tyre segment, said Apollo. Rubber Journal Asia previous owners, Bill Fairhurst and John Davison, will continue to remain involved in ILC for the foreseeable future. •	Belgian chemicals firm Solvay recently held a ground breaking ceremony for the construction of a 85,000-tonne/year Highly Dispersible Silica (HDS) facility in Poland. The new plant represents a EUR75 million investment that will create more than 50 new jobs. The site at which the new plant is located is a designated special economic zone (SEZ) and will be integrated within the industrial complex of Anwil, a subsidiary of the Polish refining and energy company PKN Orlen Capital Group, one of Central Europe’s largest refiners of crude oil. Solvay says it will produce new generation products like Zeosil Premium. appointed Ralf Cramer as President of the company’s organisation in China. Cramer has been a member of Continental’s executive board since August 2009 and head of the Chassis & Safety division since December 2007. “By 2020, China will be the world’s largest market for premium automobiles. Nowhere in the world will the demand for individual mobility and industrial goods be growing stronger than there. This is why we want to strengthen our local organisation and position ourselves to benefit from fast, profitable and lasting growth in this important market,” said CEO Elmar Degenhart. He also said that over time, more than eight out of ten of new applications are expected to be developed locally. in the rubber sector, alternative rubbers like guayule is a focus; with a new modular system for silicones offered. Sustainability in the rubber sector ith about 85% of natural rubber produced by smallholders, decisions to plant new trees and tap often depends on the opportunity cost, and hence, adequate long-term growth of the natural rubber supply calls for positive action to achieve natural rubber sustainability. This was noted at the recent International Rubber Study Group (IRSG)’s conference in Singapore. As the world increases momentum towards sustainability and corporate social responsibility, all players in the rubber industry value chain are rapidly focusing their attention onto the application of sustainability principles and the global supply chain with regard to resource efficiency/purchase of raw materials. The IRSG, an intergovernmental organisation (with 35 member governments), has called for a timely project on Sustainable Natural Rubber, with the aim of involving all stakeholders, public and private, and in both producer and consumer countries. At the World Rubber Summit held in Singapore recently, based on the recommendation of IRSG’s Heads of Delegation and the Industry Advisory Panel, a Sustainable Natural Rubber Action Plan was announced with the key objective to promote the use of voluntary sustainable natural rubber standards throughout the global rubber economy. The envisaged Sustainable Natural Rubber programme is complementary to the existing domestic economic, social and environmental programmes in producing countries and will be based on multi-stakeholder commitment and participation. The next phase of this programme will focus on the definition of relevant voluntary sustainability guidelines, policy and potential mechanisms for implementation of these guidelines through consultation with the natural rubber producer governments and other international forums on voluntary sustainability standards. Modular system for silicone rubber ermany-based Wacker has developed a modular system for pourable, addition-curing silicone rubber compounds. The Elastosil Vario compounds offer an adjustable reactivity and hardness. Compounders and silicone processors can now produce tailor-made products in any desired quantity. Typical applications are encapsulation of electronic devices and circuits and coating of technical textiles and metal or plastic surfaces. The modular system also lends itself to the production of gaskets and of silicone mould parts, such as those used for making prototypes in medical technology. It can also be used to make all kinds of reproductions and moulds. The two self-mixed components can be processed in pressureless casting systems, either by hand or with the aid of two-component mixing and metering lines. Gloves paired with outbreaks of diseases the increasing hygiene awareness. It has been operating near maximum capacity with an average utilisation rate of 90% to comply with the demand. Thus, it’s no surprise that last year, Top Glove hatched a plan to increase its global market share from an estimated 25% to 30% by end-2015. Producing 40 billion pieces/year, Top Glove expects a further boost in its global glove exports sales due to the avian flu and the stronger US dollar. Meanwhile, synthetic nitrile glove producer Hartalega says the avian flu is not a catalyst for its growth. Managing Director Kuan Mun Leong attributes the growth to the market’s reliance on its capabilities. The company, which employs an automated production model, produces 11 billion gloves/year, with 90% being nitrile gloves. In 2014, Hartalega is also starting its Next Generation Integrated Glove Manufacturing Complex (NGC) to level up its efficiency, which is expected to yield a 6% extra margin. For key rubber glove producers, it is a case of one man’s meat is another man’s poison. Emerging diseases like the flu virus outbreak in China may be morbid news to many but also raises hopes for market growth, says Angelica Buan in this report. Hygiene factors to play a part in the growth istory is being repeated as rubber glove demand was scaled up in 2010 due to the H1N1 flu pandemic. Even then, Malaysia led the roost of global glove producers and exporters to serve the medical sector, according to a study by India-based research firm Konsept Analytics. It says that countries like India, China and Brazil also showed a rise in demand for rubber gloves on account of reinforcing hygiene practices to prevent diseases. Affin also shared the same findings that hygiene awareness is driving users to demand more stringent quality gloves as well as urging healthcare centres to use gloves, noting that government initiatives in the light of disease prevention and wellness are also helping drive demand. Meanwhile in India and China, where only examination gloves are used, the research firm expects demand to triple from the 160 billion pieces used last year. Furthermore, Konsept Analytics says that increased healthcare expenditure is driving glove sales in the US, which remains a major importer, and in the UK and major European countries. The New Delhi-headquartered firm’s report also indicates that low-end powdered latex gloves are favoured by cost-conscious end-users in developing countries, while powder-free latex and nitrile gloves are preferred by developed countries, including the US and Europe. Rubber Journal Asia Gloves from using natural rubber gloves, requiring PPE manufacturers to create alternative solutions for hand protection. Ansell has also introduced TouchNTuff 83-500 sterile polyisoprene gloves and TouchNTuff 93-700 sterile nitrile gloves in response to a global study among more than 130 wearers of single-use gloves across the life sciences segments. The study found that fit and comfort, along with using a material not made from latex, were important factors to glove wearers. Designed for sterile environments, TouchNTuff 93-700 gloves provide a high level of chemical splash exposure resistance for a wide range of chemicals while maintaining an enhanced degree of comfort, longer cuffs for forearm safety, and textured fingertips for optimal grip performance. Launch of powder-free gloves ustralian company Ansell recently introduced a powder-free glove range for the Chinese market, which includes Gammex PF with AMT antimicrobial technology; and latex and accelerator-free Gammex PF Accelerator-Free Sensitive surgical gloves, developed for individuals with sensitive skins. German scientists develop toxin-busting gloves aintaining a safe work environment especially for laboratories that deal with dangerous chemicals can be tricky as some toxic substances are odourless or colourless, traces of which could be hazardous. In response to this, scientists at the Fraunhofer Research Institute in Germany have introduced colour-changing gloves. Austrian glove maker Sempermed addresses concerns on hospital acquired infections (HAIs) with the launch of the Supreme Green powder-free NR latex glove, designed for glove wearers that prefer extra hand hygiene. Detecting the traces is what the Fraunhofer scientists worked on resolving and thus came up with a novel protective glove that immediately changes colour when it comes into contact with toxic materials. The glove prototype is textile-coated in a dye containing specific sensor particles, which react to the presence of certain substances (like carbon monoxide or hydrogen sulphide) by turning blue within seconds. The dye can be integrated into the safety gear for laboratory workers or used in tools for finding gas line leaks or detecting food spoilage. The project is still in its early stages and undergoing improvements. Variability costs you money. For the highest volume applications like preforms and closures, the injection molding equipment you invest in will make a big contribution to your bottom line. Investing in a complete Husky system ensures tighter process control, reduced resin consumption, lower scrap rates and increased production predictability—allowing you to consistently produce and ship higher quality parts. When compared to competitors, Husky preform systems are capable of delivering the highest rate of return, making them one of the best investments to grow your business. Husky helps you reduce variability in your injection molding process, so you can focus on what matters most—satisfied ­customers and a healthy bottom line. Visit www.husky.ca/preform-solutions to learn more about the benefits of Husky’s complete PET preform systems.